Making a round trip of up to 90 000km a year while weighing about the same as a quarter pound burger and seeing more continuous daylight than any other animal on earth in the north and south polar summers makes this elegant extreme flier one of the most remarkable of all birds. Average Length: 33 to 39 cm long (13 - 15.5 inches), wingspan 66 - 77 cm (26 - 30 inches). Breeding Season: April/May in the Arctic summer, when the young have fledged and become independent, they then fly to Antarctica (including the juveniles) where they winter during the Antarctic summer before flying back again to the Arctic to breed the following year. Estimated world population: 2 million individuals, 500-900,000 breeding pairs in Europe. Feeding & diet: Opportunistic feeders, they feed on fish and larger zooplankton such as krill especially when in Antarctica. They catch their prey by seeing them from the air, searching and hovering much like a hawk does on the land and then diving to catch them. Conservation status: Conservation status - a conservation priority in some parts of the range. Distribution: Circumpolar around the Arctic including many islands, native to the far north usually found in treeless tundra. Predators: Nests are vulnerable as they are generally on the ground, arctic foxes, polar bears and mink may take eggs and chicks. 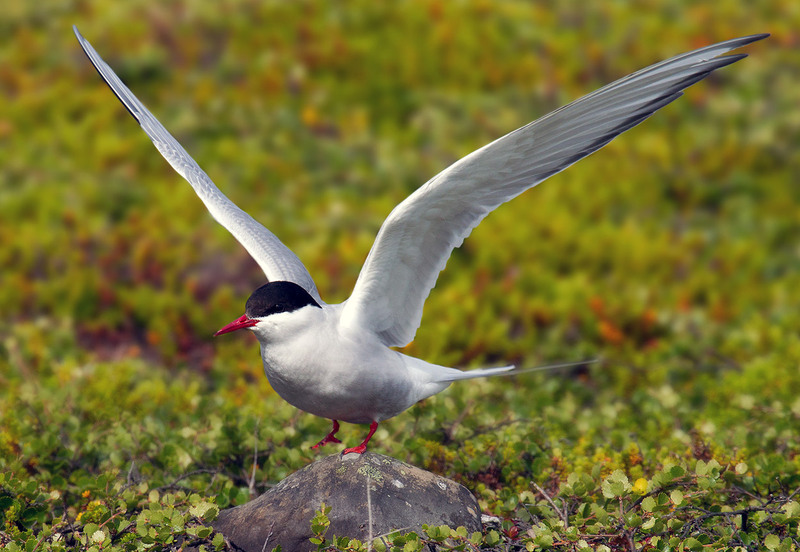 What are Arctic Terns like? how do they survive? The Arctic Tern is a member of a very exclusive animal club, it can be found at different times at both poles. The polar regions are areas of very high seasonal productivity. Very long day length with up to 24 hours daylight in the summer depending on the distance to the pole. This means that photosynthetic productivity (plant growth) is in overdrive, especially in the sea which leads to an abundance of other potential food a little further along the food chain which is then available to larger animals such as birds like terns. Such is this abundance of seasonal food, it is actually worth the effort for terns to fly the length of the planet to take advantage of the Antarctic summer after spending the Arctic summer having partaken of its own seasonal abundance. They breed in the Arctic and use Antarctica as the wintering grounds (though it is the Antarctic summer!). 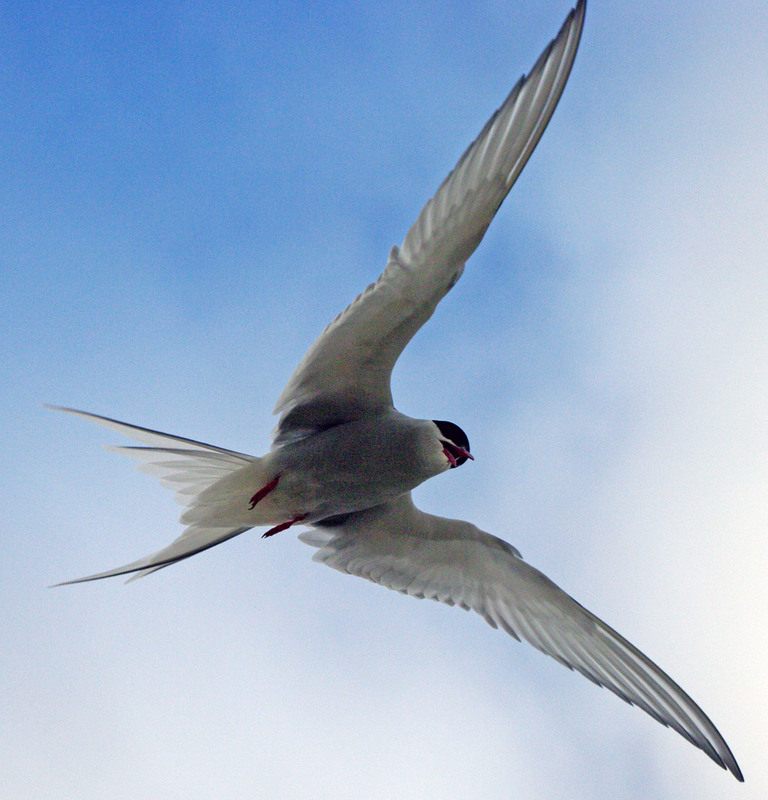 The flying abilities of Arctic terns are amongst the most astonishing of any birds. They have a length of a little over 30cm (a foot), a wingspan of less than a meter (about two and a half feet) and a weight of around 100g (3.5oz, or a little less than a quarterpounder burger). Despite this, they have been measured at flying up 90,000 km (nearly 56,000 miles) a year. This has recently be proven by attaching trackers onto birds and is around twice the previously thought distance. The reason is that the birds follow the prevailing wind patterns that carry them along rather than taking the most direct routes. They stop over in an area of upwelling and high productivity in the North-Atlantic for around 25 days when flying south. It takes them about 3 months on the journey south, but only around 40 days to fly back north again, mainly due to the strength of the prevailing winds. They arrive in the north in April/May, mate, nest and rear their young. They leave again in July/August to reach Antarctica in November where they stay until February/March. Both the Arctic and the Antarctic have 24 hours daylight in mid-summer and Arctic Terns are in both places in mid summer. They are most probably the animal that experiences the most daylight of any on the planet. Arctic terns have a very particular and extreme lifestyle, all the more surprising when you realise how small they are, they have a number of anatomical, behavioural and physiological adaptations that allow them to survive successfully. Very high metabolic rate (physiological) - Many polar and cold climate birds deal with cold temperatures by consuming and burning food to generate heat from within. In order to do this they have to consume high energy food that is easily and quickly digestible. The fish and oily krill and other prey that terns feed on provide the readily accessible fuel that enables them to live their fast-paced life. Dive bomb other animals that approach the nest, aiming at the head (behavioural) - Whether a potential predator or just some big clumsy animal that might trample the nest, eggs and chicks, they all come in for the same treatment. 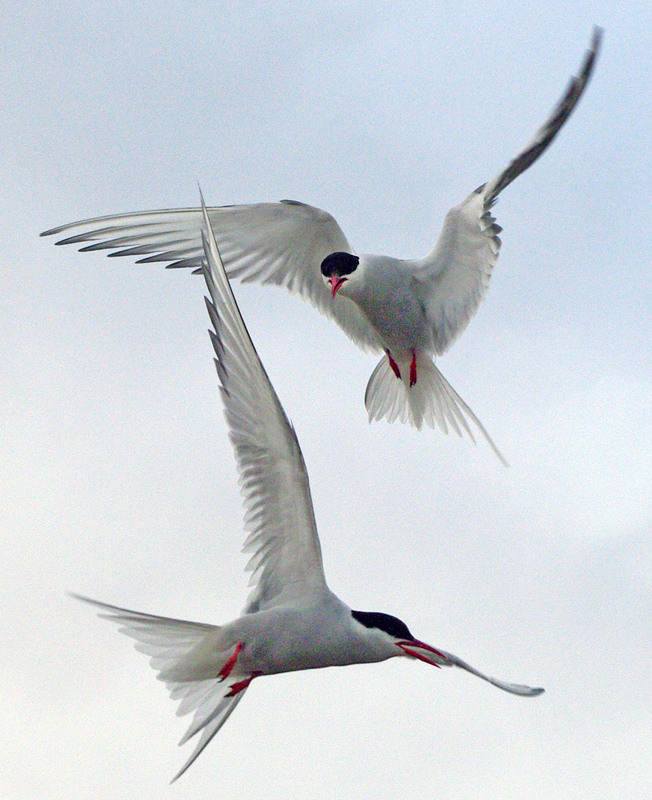 Arctic terns dive repeatedly at any animal (including man) that they think represents a threat. They call out in alarm and repeatedly attack from behind the head so they have maximum disorientation effect and are less likely to be harmed themselves. They keep going as long as they feel threatened and stop when the threat is sufficiently far away. Often you will have no idea where the nest actually is other than somewhere near where you were. A frantic term attack can leave even a polar bear with bloody wounds to the head! Nests in colonies with other birds (behavioural) - This maximizes the effectiveness of the defensive dive-bombing behaviour with many birds involved at the same time. Flies from the Arctic to Antarctic and back again every year (behavioural) - Arctic Terns nest in the Arctic during the summer, when their young have fledged and become independent, they then fly to Antarctica (including the juveniles) where they winter during the Antarctic summer before flying back again to the Arctic to breed the following year. They do this to take advantage of food abundances at the peak times of year and to avoid food shortages at other times. They nest and rear their young all around the Arctic, though mainly fly south along an Atlantic route before spreading out again once in Antarctica. Fantastic fliers - as you might imagine (anatomical and physiological) - Shaped with tail feathers that can be spread wide or pulled into a narrow dart to change aerodynamics in flight for covering distance or hovering and diving while feeding. Hollow bones for lightness. Able to sleep on the wing during migrations. Short legs that aid an aerodynamic shape in the air but make the birds rather clumsy on the ground.